Implementing an internal carbon price requires exploring options, designing an approach, building stakeholder support, seeking approval from senior leaders, and putting the policy into practice. Institutions come to carbon pricing with a range of goals and priorities, and each pricing model lends itself to some aims more than others. One approach may reduce emissions faster, while another may enable greater community education and engagement. Schools have different constraints that may favor one model. If a school does not submeter energy consumption, for instance, it might prefer a fee on flights or a proxy price over an internal levy on building energy consumption. Once an institution clarifies its aims and selects an approach, it can customize the policy to align with its goals and philosophy. How the policy will be updated. Decide how revenue will be allocated. What possible options will be modeled. Below we summarize the primary organizational variables relevant to internal carbon pricing: types of emissions data; organizational structure; and funding process. Perhaps the most important consideration for institutions looking at internal carbon pricing is the availability of emissions data. Some institutions, like Yale, meter energy consumption at the building level, which enables building-level carbon charges. Others meter energy consumption at the campus- or school-level, which, if the institution has multiple campuses or schools, could enable carbon charges at that level. Many institutions do not meter energy consumption below the level of the entire organization. Other options exist in these cases. Swarthmore, for example, applies a social cost of carbon to the entire college, and each department contributes its share of the levy in proportion to its operating budget. Alternatively, institutions can levy a price on specific, measurable components of their emissions profile, such as purchased materials or air travel. If an institution has centralized purchasing, for instance, then it can apply life cycle analyses to purchased materials and equipment to determine carbon impacts from purchasing, applying carbon prices accordingly. Or if an institution tracks travel data centrally, it can apply carbon fees to travel purchases. Institutional size and complexity strongly influence the internal carbon pricing approach. Consider three types of institutions. 1. Small institutions, like Swarthmore College, often have one top-level organizational unit (the college). Below that are academic departments, administrative offices, and possibly operational offices, such as hospitality or information technology. 2. Larger colleges and small universities have a handful of organizational units. For example, Oberlin has a college and a conservatory; Brandeis and Dartmouth have a college and a few professional schools each. 3. Research universities have several schools, offices, and operational departments. 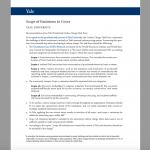 For example, Yale has around 50 planning units comprising over a dozen graduate and professional schools and more than three dozen administrative offices and operational departments such as the office of the president, development, facilities, information technology services, and athletics. Within institutions of higher education, it is common for organizational units to rely on the central institution (or center) for funding. We call these units centrally-supported. They either have no revenue or their revenues don’t meet expenses. Centrally-supported units often lack significant budget authority, negotiate with the center over which expenditures are appropriate, and have difficulty saving up for self-directed investments because the center may sweep budget surpluses at year-end. This can make it difficult to respond to carbon pricing mechanisms (though it is far from impossible). 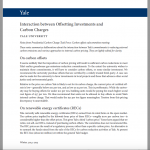 More than two-thirds of the units participating in Yale’s carbon charge are centrally-supported. In contrast, self-supported units have revenue greater than expenses. This gives them greater authority to spend funds as they wish, retain budget surpluses, and build reserves. This improves their ability to invest in projects that reduce carbon emissions and may make it easier to respond to carbon pricing. Additionally, a unit may or may not have control over building investments. Even if a pricing approach cannot change this, it should promote transparency in the mechanisms available to reduce emissions. Social cost of carbon: This framework attempts to put a dollar value on the global impacts of climate change from one additional ton of carbon dioxide equivalent emitted. Social costs of carbon vary widely depending on discount rate. Target consistent price: This approach uses economic models to determine the necessary price for a particular emissions pathway (e.g. two-degrees warming). Institutional implicit price: An institution may calculate the total estimated cost of achieving a climate action goal, such as carbon neutrality, then divide that cost by the number of tons of carbon the institution expects to emit in a given year, and set that as the price of carbon. Anticipated explicit price: This framework estimates a future, external carbon price. Offset price: Carbon can be valued at the price of offsetting one MTCDE. This framework is particularly appropriate if the revenue raised from a levy is used to purchase offsets or renewable energy certificates. Benchmark price: An institution may also consider what prices other companies, governments, and schools use in their programs. 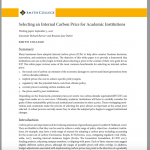 Selecting an Internal Carbon Price for Academic Institutions, from Smith College, presents considerations and trade-offs in selecting a price, and the range of prices each of these frames suggests. Will your carbon pricing incentive result in emissions reduction? At least three factors determine the power of a carbon pricing incentive: Who pays the price; how high the price is; and how much latitude those affected have in responding to the price. Policy > incentive > response > efficacy > impact. Policy doesn’t directly influence reductions. Only changes in energy demand or emissions capture cause emissions reductions. Think about this causal chain: Policy may or may not create an incentive; if it does, people may respond less or more to the incentive; if they do respond, their actions may be more or less effective; if they are effective, they will result in emissions reduction. Pathways from a good idea to an existing program vary. The following suggestions are based on the authors’ experience. Policy proposals aimed at institutional change benefit from the improvement and buy-in that a representative, deliberative process afford. The ideal first step is to convene a group to clarify goals, assess institutional attributes, evaluate potential policy options, design a proposal, and solicit feedback from stakeholders and decision-makers. We recommend an iterative process including, at minimum, representatives from sustainability, facilities, finance, the faculty, the student body, and units that may be subject to a fee. And in addition to the internal carbon price design, the working group should develop a plan for implementation and continued oversight, updating, and refinement of the program. When proposing institutional changes, clarity on decision-making roles can improve and speed the process. Bain & Co. has a useful framework called RAPID®, which delineates five roles in a decision-making process: Recommend; Agree; Perform; Input; and Decide. In this framework, the Recommender (the group developing the carbon pricing proposal in this case) is responsible for developing and evaluating options, soliciting Input from stakeholders, and gaining Agreement from anyone whose views must be incorporated into the decision. Those responsible for Performing based on the decision are particularly vital stakeholders. The Recommender develops and refines multiple proposal options based on research and input and provides options, along with an explicit recommendation, to the Decision-maker. Provide options that are equally well-developed. Decision-makers will be able to understand the issue and its challenges better, and likely will feel more inclined to accept a recommendation, if they know all good options have been thoroughly explored. It is the Recommender’s job to solicit and process input to share with the Decision-maker. When the Decision-maker solicits input directly—particularly after a decision has purportedly been made—it can undermine the quality of the deliberative process and impede the implementation of a decision. Institutional stakeholders hold a variety of definitions of what is fair in a policy. This document outlines fairness concerns with an internal carbon fee. Considerations on the scope of emissions that should be covered by Yale’s Carbon Charge and how to enable participation by units that pay their own utilities and those that do not. Reflections on the inconsistency in prices per ton of carbon among offsets, carbon fees, and renewable energy certificates. White paper to guide institutions in the price selection process. Presents the various frames for understanding an appropriate cost of carbon and what price levels they each prescribe. Includes considerations on the process for determining a price. 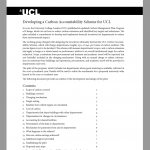 Document outlining the development and design of a pilot carbon accountability scheme at University College London. 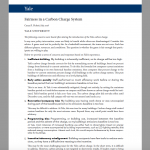 Includes considerations for scope of carbon covered and mechanisms for charging departments. In this toolkit, we refer to organizational components of an institution as “units.” At large institutions, units may be comparable to business units or divisions in a for-profit organization. Larger institutions may have several units, such as schools, museums, libraries, administrative offices, and operational departments. At small institutions, which may operate as one continuous entity, it may be appropriate to think of administrative offices and academic and operational departments as units. We use the term to refer to organizational entities that could participate in internal carbon pricing.